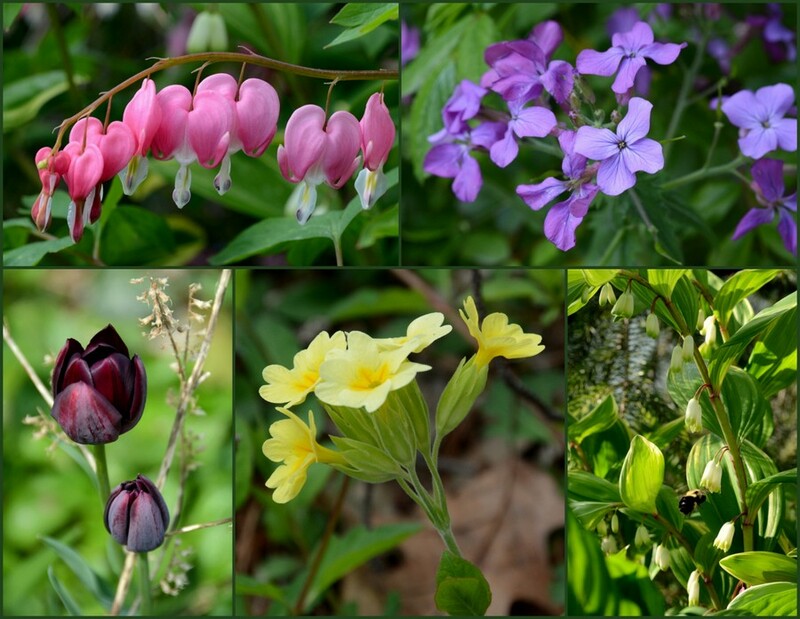 Flowering dogwood, Kwanzan cherry, and tulips are still blooming along with variegated Solomon's Seal, Cowslip, Bleeding Hearts and Money plants. Grapevines and hostas are leafing out and Azalea blossoms are just opening up to start showing off their beauty. The beautiful colors and pleasant fragrances sure soften the blow of the damage done this past winter of 2013. New Jersey's third coldest winter since 1982. We enjoyed visiting Popes' Gardens yesterday where we bought new rosemary plants to replace ALL the rosemary that died. Even our larger rosemary shrub, Rosmarinus officinalis 'Gorizia', that we've had for 9 years - died after the 2013 winter. I decided to replace only the rosemary that we use in cooking, so we selected upright blue rosemary and not the coarse-needle ARP or Gorizia shrub-type. Joan Pope, one of the owners said she heard several of her NJ customers saying that they lost their rosemary AND butterfly bushes. When I got home I checked our butterfly bushes and a few do look dead, including our 10-year old buddleia bi-color. Some shrubs show definite signs of life, but others, not even one leaf. Maybe those that look dead are just late in leafing out, which is normal for buddleias. So if yours looks dead too, yes it could be, but it may just be late. I'd at least give it to the end of the month before you dig it out. What else did Winter 2013 kill in your Garden? Our little 6-year old fig tree sure appears dead. The black branch tips show no signs of life at all. In fact, lichen is starting to grow on it's slender trunk. I'm not going to completely give up hope yet or dig it up until June, just to be absolutely sure. Besides the few replacement rosemary plants, hot peppers, sweet peppers and rhubarb, we picked up Coronado Hyssop, introduced by Denver Botanic Gardens and Colorado State University, which will surely please the hummingbirds. The silvery leaves are aromatic too, which makes it a welcomed garden addition to a sunny, well-drained site. At the entrance to Popes' Gardens you'll be greeted by their friendly goat and mascot, Rosey. Rosey has a goat friend too, not sure of his or her name. In a huge field behind their greenhouses, we visited some interesting animals. Here are a few pictures of their sweet-faced Alpacas and hairy Highland Cattle. The Alpacas were quite personable! Uncommon Nutrition from the Common Fig ~ Ficus carica - scroll to the bottom of the article to see our little fig tree when it was only 1-year old. It survived 5 winters without protection prior to 2013.